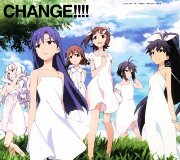 The IDOLM@STER ANIM@TION MASTER 04 Change!! 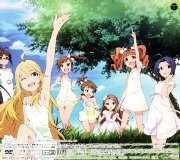 This CD+DVD package contains the opening song and character songs for the TV anime THE IDOLM@STER. Songs by the following cast. The DVD contains a non-credit version of the opening animation, some animated videos of the Playstation 3 Idolmaster 2, and some seiyuu clips. There is some talk by Hasegawa Akiko, Asakura Azumi, Hara Yumi, and Numakura Manami.